How to increase my profit? - this mercantile yet reasonable question has been a central one for every generation of mankind since the year dot. The very same issue keeps bothering e-Commerce merchants now. Well, there is a universal answer - get off the sidelines and make things done. The more precise would be - utilize the existing customer base of yours. Still not specific enough? Here is a laconic list of 10 practical ways to increase profit from your retained customers. 1. Implement rewards program - an effective retention and AOV increasing tactic - to thank customers for their loyalty. Since your existing customers are the main profit source, make sure you have something to treat them with. 2. Create a platform for customer socialization - an online forum. That’s the place where they’ll be able to talk to each other, discuss your products and get the needed information. This is also yet another reason to get back to your site. 3. Study out the purchase history information to send properly targeted suggestion emails to bring a customer back and buy more. To leave them no chance to avoid the seduction, include a discount coupon code with a limited validity. That will make them act! 4. Define what is the “hot season” for your customers and target a marketing campaign at them during this time. Usually, with holidays getting closer, it’s dog eat dog for every merchant in your niche. So distinguish yourself: offer discounts, additional reward points, free shipping or even a little greeting card. 5. Package some of the items by adding supplemental ones and create the bundles of products typically bought together. The customers will get a little discount, and you’ll increase AOV plus, as a result, maximize your profit. A winning tactic! 6. Turn the customers into your best business partners by implementing a referral program - one of the best forms of marketing when it comes to conversions. Reward them for participation in customer acquisition and raise not your profits only, but loyalty of the current customers also. 7. Offer the customers who’ve reached a certain checkout price point to get some complimentary items. If they’d know you distribute little bonuses at a definite price point, the customers will try to hit the mark every time they feel to be somewhat near to it. 8. Take care of customer feedback, no matter is it good or bad. Whenever someone attacks you - don’t fight back, but consider it as a chance to demonstrate your loyalty and the fact that you care. Apologize and offer a chargeback (if customer requires) or something in exchange - your reputation worths more. 9. Always have a person ready to answer and dispel the doubts that keep your customers back from performing yet another purchase. Take a use of a live chat module and a toll free telephone number so that you’ll be on the reach via method convenient for every single client. 10. Loyal customers haven’t shown up to your site in a while? Bring them back by sending out automated emails telling how much you miss them. Don’t forget to offer a little incentive or just promote some of the newest products. Also, make sure the email links lead to relevant product pages, not merely homepage. 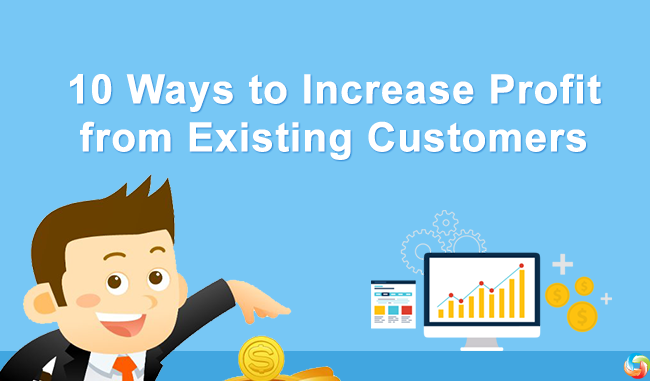 These are 10 ways to increase profits from existing customers. Though your loyal buyers is an endless source of profit, don’t go too far exploiting them. Remember to prove you worthy of their love by offering them best possible service and incentives to stay devoted. Have something to add to this list? Feel free to share it in the comments.